With The Wire now off the air, Battlestar Galactica can make a strong case for being the best show on TV. 953 min. Sci-Fi Channel. Cast: Michael Hogan, Edward James Olmos. With The Wire now off the air, Battlestar Galactica can make a strong case for being the best show on TV. Like Lost, Battlestar Galactica has a complex but accessible mythology, a sprawling cast of strong character actors, and catchy mysteries ("Who are the Final Five?" versus Lost's "Who are the Oceanic Six?"). And like Lost, Battlestar Galactica applies its genre trappings to weekly morality plays with contemporary social relevance and universal themes. Battlestar Galactica is particularly tuned into current events. A concurrent story of two civilizations at war--The Twelve Colonies of Kobol and The Cylons--BSG consistently evokes the War on Terror, Guantanamo Bay, and the Patriot Act (see especially the episode "Collaborators") as well as the Israeli-Palestinian conflict over the Holy Land. Both groups believe it is their destiny to settle on the fabled Thirteenth Colony, known as Earth. Commander Adama (Edward James Olmos) of the Battlestar Galactica leads a refugee fleet of colonists, including President Laura Roslin (Mary McDonnell), while traitorous Dr. Gaius Baltar (James Callis) finds himself indentured among the Cylons. The Cylons, long ago created by the Colonists, are a cybernetic race capable of taking human form--twelve human forms to be precise. We've seen seven of those models: hence, the "Final Five" yet to be revealed by season's outset. The refugees are divided, most having thrown in their lot to settle on a planet they dub New Caprica while loyal soldiers remain with the fleet in case of Cylon attack. When the Cylons strike New Caprica and occupy it, the fleet retreats but pledges to return. When Season Three opens, four months of occupation have passed, and a ragtag group of insurgents is committing acts of terrorism against the Cylon occupiers. Ostensibly then, our "heroes" are suicide bombers while the "villains" are motivated to spread the word of one God to the captive polytheistic population of New Caprica. Of course, creator Ronald D. Moore—having thoroughly complicated the 1978 ABC TV series on which his Sci-Fi Channel version is based—isn't interested in easy answers. By season's end, more preconceptions explode as characters die, Baltar faces the music from both Cylons and humans, and four more Cylon models are revealed, among other surprises. With the show's final season about to begin, now's the time to catch up with one of TV's best. Watching TV has changed quite a bit in a short amount of time, due to the influence of DVR technology, DVD, and the internet. The latter two technologies are directly relevant to the home video release of Battlestar Galactica—Season Three: not only can a fanatic (or casual viewer) have access to the commercial-free episodes on DVD, but over fifteen hours worth of bonus content, including a commentary track on every episode and other content originally produced for the series' promotional website, including short "webisodes" that extend the story. Disc One: Episodes 1-4 (with "Play All" option). The disc spins up to a Season Four teaser for Battlestar Galactica, followed by trailers for The Incredible Hulk: The Complete First & Second Seasons and Heroes: Season 1 on DVD and HD-DVD. All four episodes on disc one—"Occupation," "Precipice," "Exodus, Part 1" and "Exodus, Part 2"—include a podcast commentary with Ronald D. Moore (and guests of his choosing). One can also watch "Deleted Scenes" for "Occupation," "Precipice," and "Exodus, Part 2." Lastly, the disc's "Sneak Peeks" include trailers for Knight Rider/The A-Team/Magnum P.I., The Incredible Hulk, The Rockford Files, Miami Vice, Saturday Night Live, Quantum Leap, Monk, and House. Disc Two: Episodes 5-7 (with "Play All" option). "Collaborators," "Torn," and "A Measure of Salvation each carry a podcast commentary with Moore and deleted scenes. 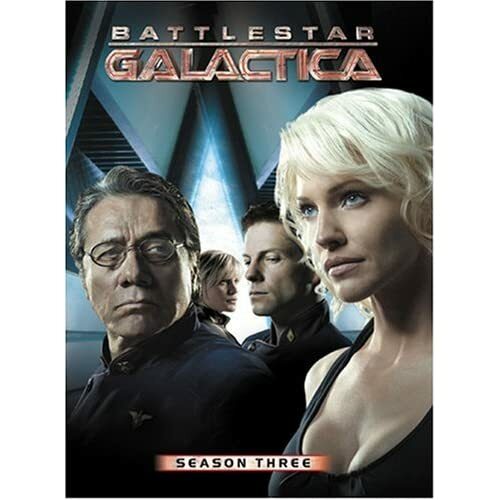 Disc two also houses the ten webisodes of Battlestar Galactica: The Resistance, which chronicles the growth of the rebel group on New Caprica; each episode runs between three and four minutes. Disc two also has the first set of executive producer "David Eick's Video Blogs": "Testimonials," "Who Dies?," "Prosthetics," "Lucy and David," and "Introducing Bulldog." Disc Three: Episodes 8-10 (with "Play All" option). "Hero" includes both a podcast commentary with Moore and a fresh commentary by Eick, as well as deleted scenes. The episode "Unfinished Business" appears in two forms, the broadcast version with podcast commentary with Grace Park and Tahmoh Penikett, and Moore's DVD-exclusive "Extended Cut," which is twenty-five minutes longer and includes a new commentary by Moore. "David Eick's Video Blogs" include "Characters," "Adama On Adama," "Episode 6 Read-Through," "On the Road," "Steve McNutt Gets a Video Blog," and "The Soldier's Code: Leave No Man Behind." Disc Four: Episodes 11-14 (with "Play All" option). "The Passage," "The Eye of Jupiter," "Rapture," and "Taking a Break From All Your Worries" all include both podcast commentary with Moore and deleted scenes. Disc Five: Episodes 15-18 (with "Play All" option). "The Woman King," "A Day in the Life," "Dirty Hands," and "Maelstrom" all include both podcast commentary with Moore and deleted scenes. Disc Six: Episodes 19-21 (with "Play All" option). "The Son Also Rises" includes two podcast commentaries, one with Moore and one with actor Mark Sheppard and writer Michael Angeli. "Crossroads, Part 1" and "Crossroads, Part 2" include two podcast commentaries as well, one with Moore and one with Sheppard for each. All three episodes have deleted scenes. "David Eick's Video Blogs" this time are "Takin' a Break From All Your Worries," "On the Road: Part 2," "Some Guy Named Colin," "Building a Better Show," "Katee's Scrapbook," "Shooting," "Mr. Eddie If You Please...", "Oceans in the Desert," "David Who? ", "Out of Control," and "Last Episode Blues." All of the episodes and webisodes include English and Spanish subtitling, and sound especially good in surround sound (the picture quality can tend to the grainy and soft, but that's in keeping with the show's style). The bonus features will appeal mostly to die-hard fans: Moore's casual commentaries allow the viewer a special intimacy with a series "show-runner" and Eick's video blogs capture the exhaustion and fun of producing a TV series with a minimum of time and a maximum of effort and camaraderie. And naturally, the deleted scenes give added insight into the shape of original scripts before timing necessitates trims. Taken as a whole, it's hard to imagine asking more of this set: in the context of previous and forthcoming DVD releases, fans will get to know just about everything they'd like to know about their favorite series, and perhaps more. All site content © 2000-2019 Peter Canavese. Page generated at 04/17/2019 03:34:32PM.